This work describes famous episodes of courage and cunning through the ages; spy craft and spy gadgets. Discover the top secret world of secret agents, from the Ancient Romans to the Cold War and beyond. This is the fifteenth book in the fantastic non-fiction series, It's True . Psst! It's True ! This is the best book on spies you'll ever read! Spy on the spies and go undercover in history! Did you know that the creator of fictional spy James Bond was a secret agent himself? One Saxon king got information while singing love songs in the enemy camp. An Australian spy (a man) steered a ship through a storm wearing only a pink negligee. The CIA plotted against Cuban dictator Castro's beard. A brave ex-slave sent information to the Union Army during the American Civil war by hanging up her washing. If you think these stories are way out, wait till you decode the rest of the top-secret information in It's True! 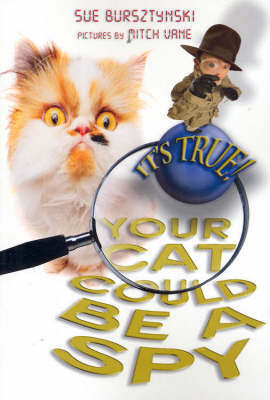 Your Cat Could Be A Spy.